I'm not going to be drawn into any arguments of whether something is Shepherd's Pie or Cottage Pie. For me, if it is made from mince from either lamb or beef, with a few vegetables perhaps, and covered with mash potato, it is Shepherd's Pie, and I'm one of the biggest pedants around. 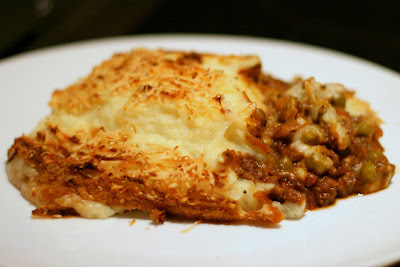 I don't make Shepherd's Pie that often, although it is definitely a favourite of mine. I'm not sure where I learnt how to make it, although it's like that I got it from my mum. However, the other day I saw one of the super-quick Gordon Ramsay recipes on the 'F-Word' compilation they put on over Christmas, and was interested in his alternative methods to the way I make it. Plus, I thought it would definitely make a nice, warming dish with it feeling like snow will fall at any minute. There are a lot of things I like about Gordon Ramsay, and probably as much that I dislike about him. I haven't had the opportunity to sample his cooking first hand, but he does make a good TV series and provide welcome entertainment along with his annoying quirks. 'Yes?' 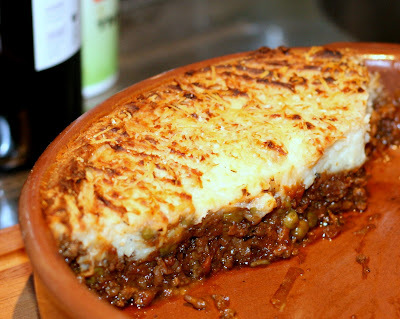 Still, looking at the results of his Shepherd's Pie, I thought I might try something similar, although where he used Red Wine, I used Guinness. I'm thinking that next time I might try both together as it was such a good combination in the past, but still, I was very satisfied with the result, although I did probably add a few more ingredients than Gordon Ramsay suggested after careful tasting during cooking. The main differences between his and my version were that with his, the mince was cooked first with the garlic, without the addition of any oil or anything, then, the grated onion and carrot added once it was lightly browned. I quite like little cubes of carrot and peas in my Shepherd's Pie (although Ramsay didn't even bother adding peas, and so he's obviously a bit of a peasant), but this time, I went with grating the carrot along with the onion just to see how the texture of the finished filling differed. I must say, it was nice, but probably immensely improved because of the peas which I added. Ramsay also stuck a couple of egg yolks into his mash, something I've seen other chefs do also, but have no idea why. All the same, I added them myself, just to see if I could work out what the difference was. I'm still not sure, but the mash was good. I pushed the potatoes through my sieve for a change, and the resultant mash was probably the smoothest I've ever made. So, discarding my previous recipes on Shepherd's Pie, take a heavy bottom pan and brown off the Mince at a medium heat. There should be enough fat and liquid still in the mince to let this cook easily without additional oil, etc. Once there is a little liquid in the pan from the Mince, add the Garlic and continue to cook and stir until the mince is lightly browned all over. Then add the Onion and Carrot and continue cook for a further 5 minutes, stirring occasionally. Next add the Tomato Purée, Ketchup, Worcestershire Sauce, Dijon Mustard, Thyme and Oregano and crumble in the Stock Cube. Stir well and cooking for a further few minutes before adding the Bottle of Guinness. The Guinness should help you de-glaze the pan of any burnt pieces of Mince from the bottom. Stir in the peas, then, cover the pan and leave to simmer until nearly all the liquid has disappeared. While the filling is simmering, peel, boil and drain the potatoes. Mash the potato with the Butter and most of the Parmesan, reserving some to be sprinkled over the top of the Shepherd's Pie before the final cooking in the oven. Once the filling is nice and thick, with the Onions and Carrot almost completely disintegrated into the Mince, and nearly all the liquid disappeared, put it into the bottom of roasting dish, then leave to cool for about 20 minutes, so that the filling has solidified slightly. Then cover with the Mash Potato, stripe with a fork and put the final layer of Parmesan and Fresh Ground Black Pepper over the top. Put in a preheated 200 degree Celsius oven for about 25 minutes until the top is golden, then serve. Mmmmm, that looks delicious and superb for these cold winter nights. Damnit! does a shephard look after cows? No! He looks after sheep, hence the name - Shephard's Pie is made with lamb...Cottage Pie is made with beef! delicious I have to say. I ve eaten all of it. even more. I do apologise you, mark that be been waiting such a long time for this comment. you deserve better . ,) L.
if a shephard looked after the sheep they wouldnt be in the pie :) which is the case here. Managed to make the mash too smooth which was a MAJOR error, also couldn't get my hands on any parmesan, although the mature cheddar was good. This is an excellent menu! I have cooked it for many people now and everyone has liked it and asked for it again.